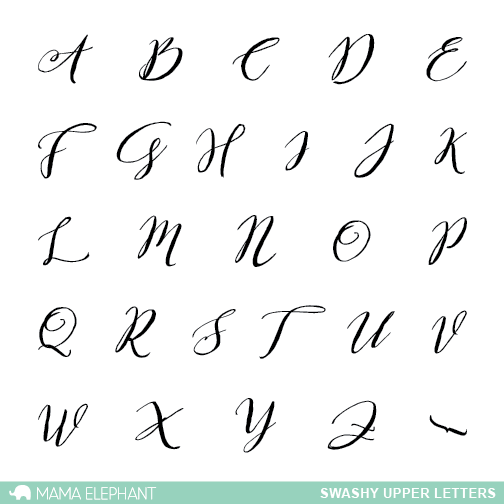 We've got a great new scripty alphabet set to add to your collection in today's Introduction! Feast your eyes on this beautiful script font that will take your stamping penmanship to the next level! Because of the nature of the swashes, created a seamless word by stamping is easy peasy! Easily personalize your projects with these swashy letters to give it that professional and timeless hand-lettered look that is all the rage! FOr my project, I created a Favor Bag for Angela for Christmas. I watercolored the trees myself and then stamped her name using Swashy Letters. I love how professional the stamping makes the handlettering looks! Our friend, Cindy also had fun playing with the new Favor Bag die and all of its accessories! Look what she came up with! I had to include this clean and simple Charlie Brown inspired one, it made me laugh! Genius! I love the jelly bean one! It was created using the negative from the handle! As you can see, this Favor Bag die is awesome and scaled large enough! It comes in at 3.25" wide and just a little over 5" tall! And check out the darling stitching and scallop detail on the top! Just a beautiful font, love how seamless it looks. Sweet bag die too! These little bags look so fun to make! Beautiful! are you able to show us a comparison of the Calli and Swashy letters side by side? Beautiful cards. The handwritten letters are so nice. Wow, another beautiful letter set. It's so easy to make personalized cards for your "unique" named friends. 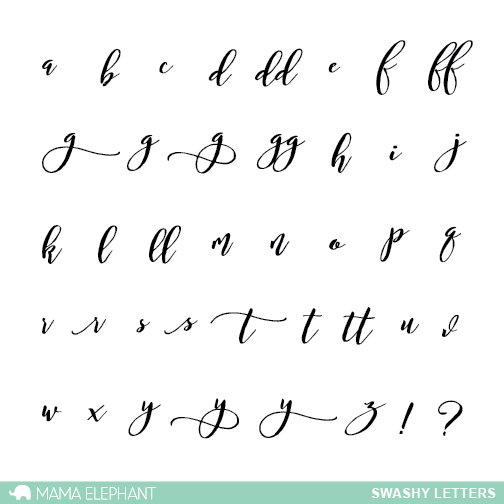 I loved Calli letters and now Swashy looks so easy to use too. I appreciate the more double letters. love the alphas and the treat bags!!! Great alphabet! It's got that fun bounce look. The treat bag samples are fabulous. Lots of fun! Awesome Swashy Letters!! Love the treat bags!! Will the treat bag die work on the cuttlebug? This release is just amazing, I love all the products. The otters are otterly adorable, the swashy letters perfectly elegant and I have already so many ideas on how to fill these little favour bags!